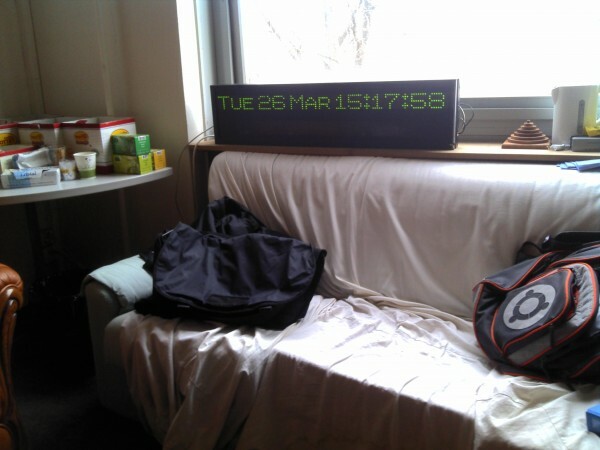 Reverse Engineering a 1992 DATA Display #piday #raspberrypi @Raspberry_Pi « Adafruit Industries – Makers, hackers, artists, designers and engineers! Part of a top, consisting of two green segments 12 of dies (7 × 5 each), or a large array of (2 * (12 * 5)) * 7 pixels. The bottom part is interesting because it seems to contain a RAM, with external connection (and a NiMH battery to retain RAM) can be upload messages to display. By cons, manufacturers do not have the transmission protocol. It will be a bit boring to reverse-engeenirer. The top part, it is almost identical. Except that it contains a ROM containing the characters ASCII (at least, their representation in matrix 5 × 7) to display the text. It also has a special connection (RS232, but not too much). It’s going to be boring to do. But I decided to disassemble the upper display and watch how it worked. Source code, photos and more here!